To counteract the excesses of the starter I posted previously, I followed it up with a simple pasta dish. It is hard to believe that something this good only has six main ingredients (or five if you want to make it vegan) but it is absolutely delicious and perfect for a midweek supper. I shall certainly be making it again! Put the pasta on to boil as per the instructions on the bag, then thinly slice the courgette (I used a mandolin to make the slices as thin as possible) and slowly fry it over a low heat with a little olive oil. Next, thinly slide the garlic cloves and after the courgettes have been cooking for about 5-7 minutes, add them to the pan. Fry for a minute or so, then add the chilli flakes, lemon juice and zest, spoon a couple of tablespoons of the pasta water into the pan and reduce until there is just enough liquid to lightly coat the pasta. Season the sauce with a little salt and pepper, then drain the pasta once it is done. Add the sauce to the pasta and serve with a sprinkle of grated parmesan if you so desire. This is the one I've been waiting for! Shall most definitely make this. Sounds, and looks, delicious. Popped over from Eat like a Girl - I see what you mean about the merit of lovely photos! I'm desperately saving up for a decent camera - having never owned a digital one, but meanwhile am having to make do with the iPhone camera, I'm ashamed to say. Better than nothing, however - at the demands of my facebook friend readers I've been getting them up, even if they sometimes (ahem) leave a little to be desired. 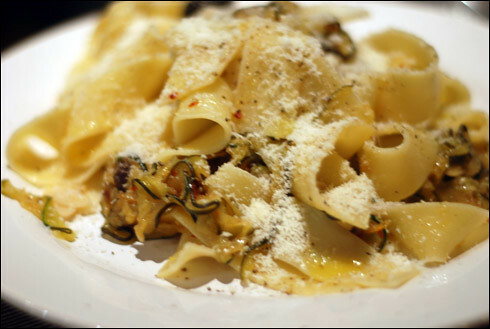 The recipe, and the photo, both look delicious - I feel a papardelle moment coming on! thank you! i don't think the iphone camera is that bad actually - especially when used with a decent amount of natural light. that said, i bought a proper dslr 5 years ago after borrowing a friend's for far too long, and i've never looked back. best purchase ever.